Extracts from the leaves of Ginkgo biloba have been suggested to be useful in the treatment of various symptoms of impaired brain functions in advanced age. To elucidate specific mechanisms of the possible clinical benefit, the effects of Ginkgo biloba extract Ginkobene® on cognitive information-processing were investigated by means of long-latency auditory event-related potentials. 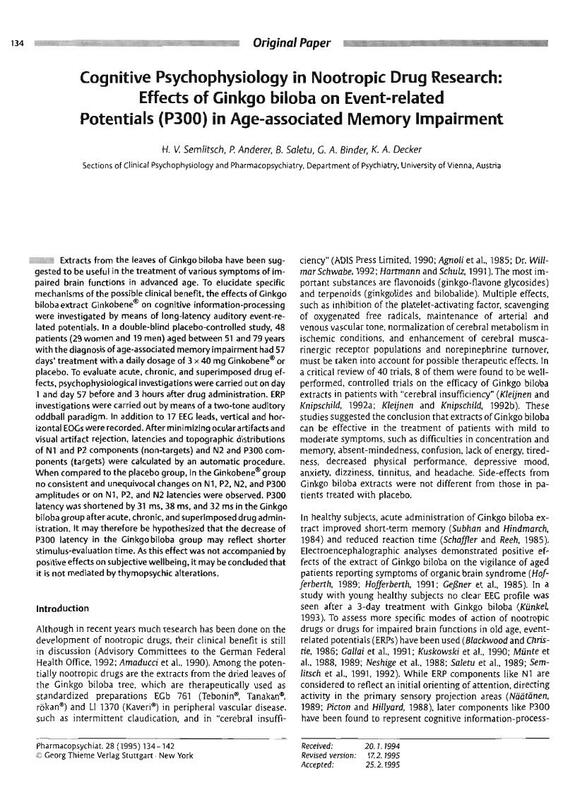 In a double-blind placebo-controlled study, 48 patients (29 women and 19 men) aged between 51 and 79 years with the diagnosis of age-associated memory impairment had 57 days' treatment with a daily dosage of 3 × 40 mg Ginkobene® or placebo. To evaluate acute, chronic, and superimposed drug effects, psychophysiological investigations were carried out on day 1 and day 57 before and 3 hours after drug administration. ERP investigations were carried out by means of a two-tone auditory oddball paradigm. In addition to 17 EEG leads, vertical and horizontal EOGs were recorded. After minimizing ocular artifacts and visual artifact rejection, latencies and topographic distributions of N1 and P2 components (non-targets) and N2 and P300 components (targets) were calculated by an automatic procedure. When compared to the placebo group, in the Ginkobene® group no consistent and unequivocal changes on N1, P2, N2, and P300 amplitudes or on N1, P2, and N2 latencies were observed. P300 latency was shortened by 31 ms, 38 ms, and 32 ms in the Ginkgo biloba group after acute, chronic, and superimposed drug administration. It may therefore be hypothesized that the decrease of P300 latency in the Ginkgo biloba group may reflect shorter stimulus-evaluation time. As this effect was not accompanied by positive effects on subjective wellbeing, it may be concluded that it is not mediated by thymopsychic alterations.